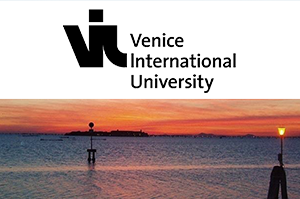 Venice International University is something unique in the academic world – a consortium of 17 universities from all over the world with an autonomous campus on the island of San Servolo, Venice, Italy. Universities today must play a strategic role in addressing the new global challenges: sustainable development, climate change and energy, food and water security, urban growth, welfare, ageing populations, the widening gap between rich and poor, global ethics, protection of tangible and intangible cultural heritage, human rights, equality, democratization, peace and conflict, global governance, cyber-security. Some of these critical global issues can be predicted, others arise unexpectedly and suddenly, and traditional training is not necessarily the best way to find solutions. Today’s students need to develop different skills, must be able to work across disciplines, to react with great flexibility and a broad intellectual range.